We wrapped up our work in Dubai early and I headed back to Doha. That picture above was one I took in the Dubai airport. I kid you not. Apparently, Santa wanted to experience some warmer climes and share the love with his Middle Eastern friends. 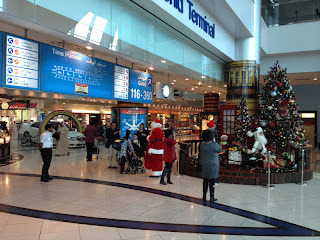 And in case you missed the guy dressed in bright red, there is a guy dressed as Santa in there. I mean the full on Christmas tree with animatronic Santa blew me away on its own, but when I crested the stairs and spied a real live Santa, I was floored. 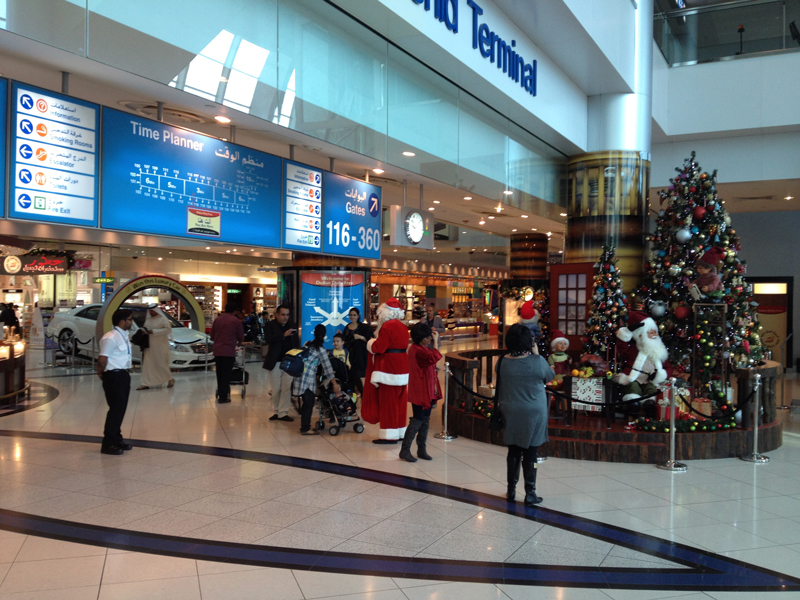 From what little data I have, Dubai seems a little more Christmas-friendly than Doha. And I'm back in Doha! 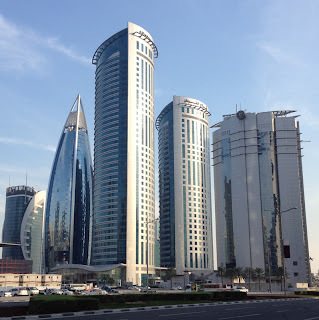 By the end of the day, I was in a new hotel (work moved me from the W to the Marriott Courtyard adjoining the City Center Mall) with a box o' boozes from the Qatar Distribution Company. I am on vacation now. It's more than a little weird. I have canceled two vacations this year and delayed/shortened this one. So, my brain is having trouble accepting it. Oh, and how awesome are the housekeeping staff here? 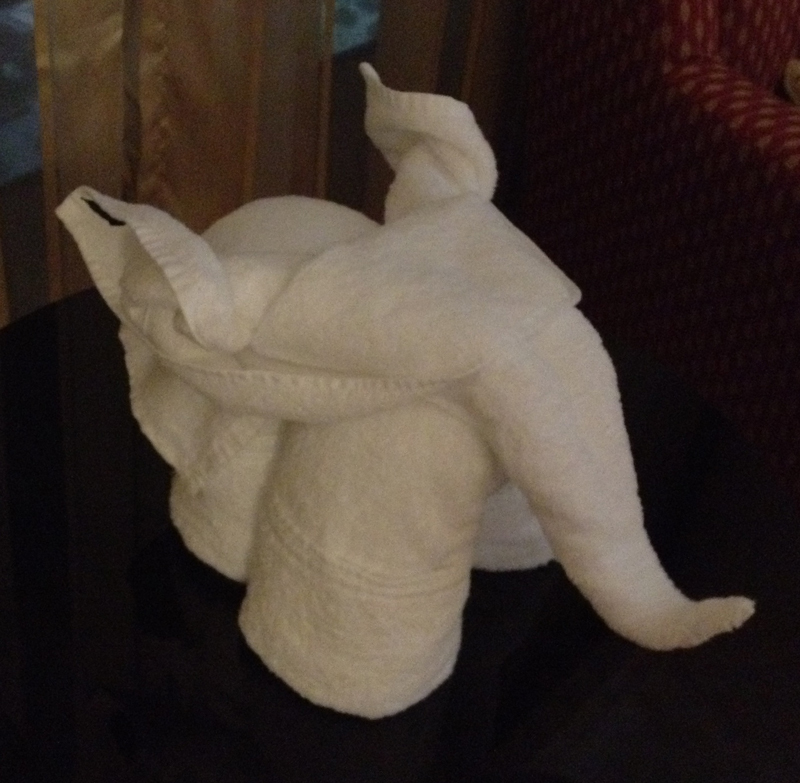 TOWEL ELEPHANT AWESOME! 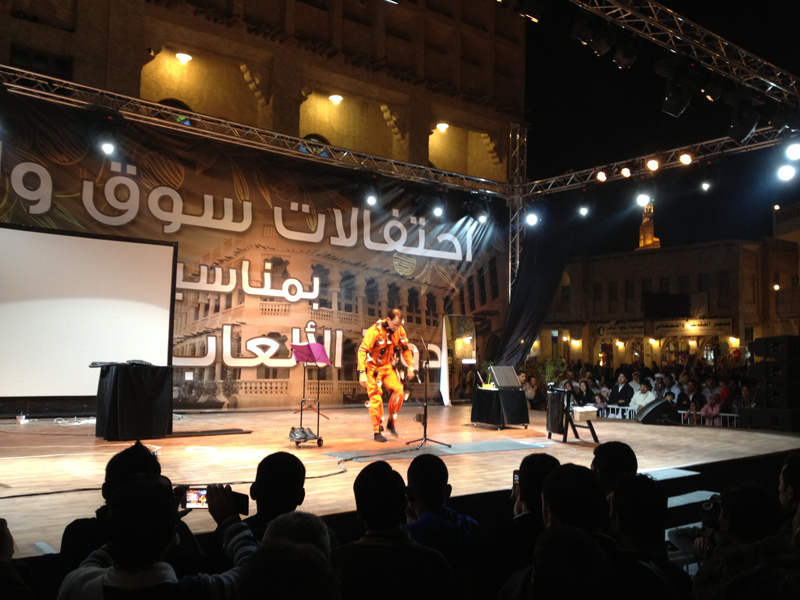 The evening was spent with another trip to Souq Waqif. This time I was hanging out with a friend from Shell that I met at the W. He wanted to show a buddy from work a good touristy time, and what better place to start than the Disney Land version of Doha, Souq Waqif? For the most part, the Souq is dry (maybe completely, but I *think* there was wine somewhere), so my box o' booze was cracked open for some tasty pre-souq beverages. This plan was full of win. For pictures and more details on the Souq, see the post about my first visit. We hit the Souq, and the visiting buddy whips out a GIGANTIC camera and hangs it around his neck, then goes into stereotypical tourist mode, snapping pictures left and right. I think he and the folks at the souq found each other equally amusing. We caught the tail end of a festival, which was apparently related to the Arab Games, which I forgot were still going. We stopped and watched a goofy act by a European gentleman (German maybe?). In this picture, he is honking out classical music with horns strapped to overalls. It was pretty goofy, but we watched and clapped and hollered, if only to make up for the stony silence of the rest of the crowd. 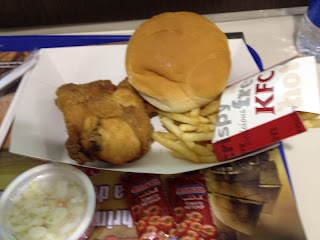 We hit Bander Aden, got a room where we could sit on the floor and eat more gigantic bread, lamb, and chicken. Show the buddy the "real life Peeps". Check. Lady friend shows up and...wait what? Well, that was it for my souq adventure. the souq isn't going anywhere. 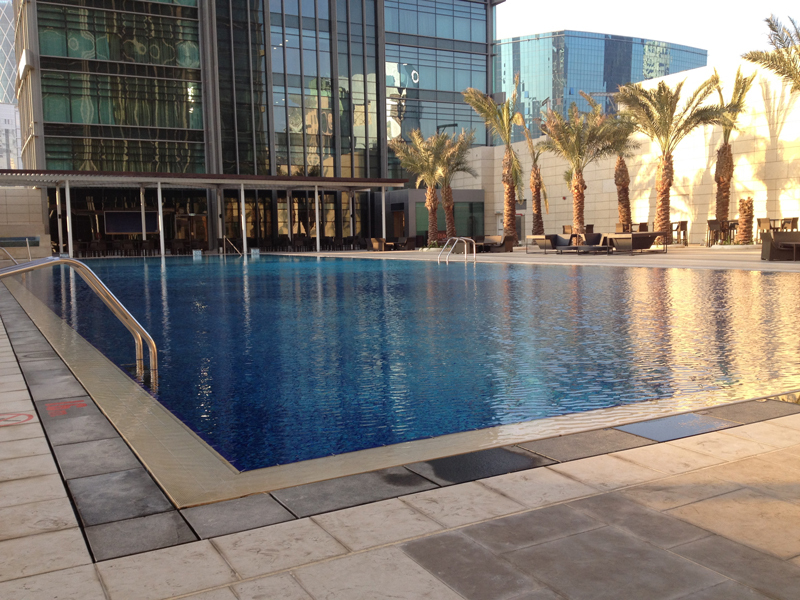 I relaxed by the pool today, sunbathed for the first time in months, maybe the third time this year. I was out there for two hours without any protection and did not get a sunburn. Weak winter Sun is weak. However, it was incredibly pleasant and relaxing. It was basically room temperature with a gentle breeze. 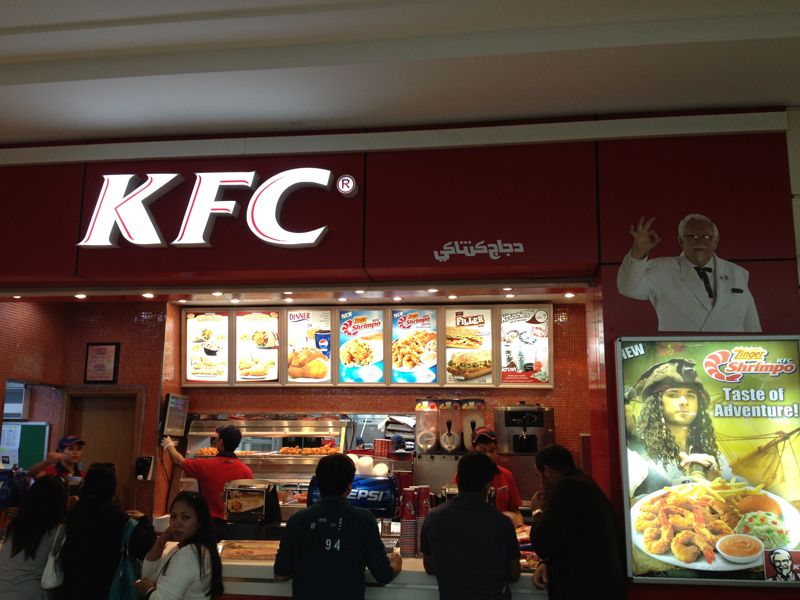 Curiosity finally overrode good judgement and I tried one of the THREE Kentucky Fried Chicken places in the City Center Mall. 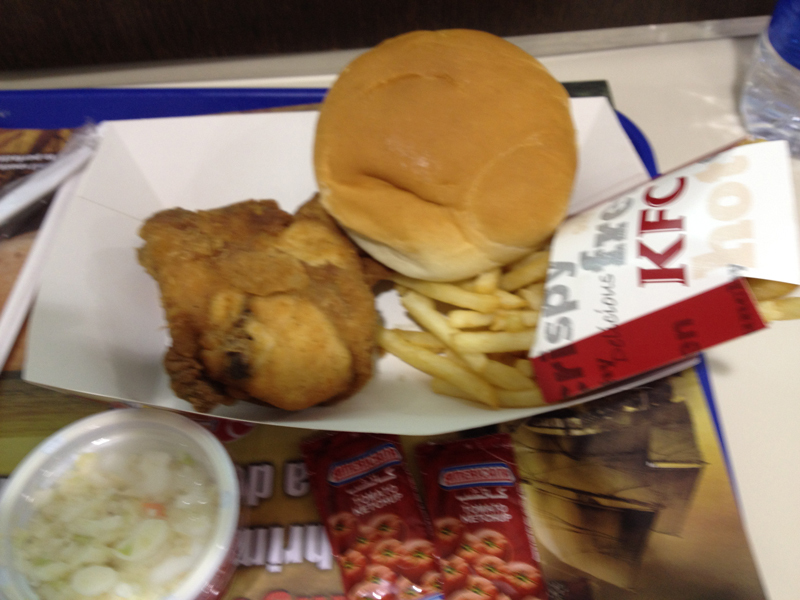 I *think* I got Original recipe, but I can't be sure. Ordering had more of a language barrier than usual. Ordering the sides was easier. I mean, there were a ton of choices - slaw, fries, slaw, fries, slaw, or fries. Now, you may notice that this picture is blurry, but that is a good thing. You see, professional photographers and cinematographers have long understood that blurring can mask dry, wrinkled things, consider Elizabeth Taylor's White Diamonds commercial. So, this blurring is for your benefit...brace yourself. You expected warm, moist, seasoned chicken that you have to resist shoveling into your mouth it's so good? Will you settle for warm? You expected fresh, yummy, seasoned french fries? Well, these are definitely french fries. You expected a biscuit? Well, how about a stock hamburger bun, not toasted, warmed, buttered, or even sliced. The cole slaw wasn't bad..and that was the high point of the meal. OK, maybe it was a bad time, an off day, whatever. But it was REALLY bad. I mean it was *almost* bad enough that I just threw it out and went somewhere else. Oh well, I had low expectations, just not quite low enough. I went on a short quixotic quest for a place that sold good boots and snapped some nice pictures of buildings along the way. 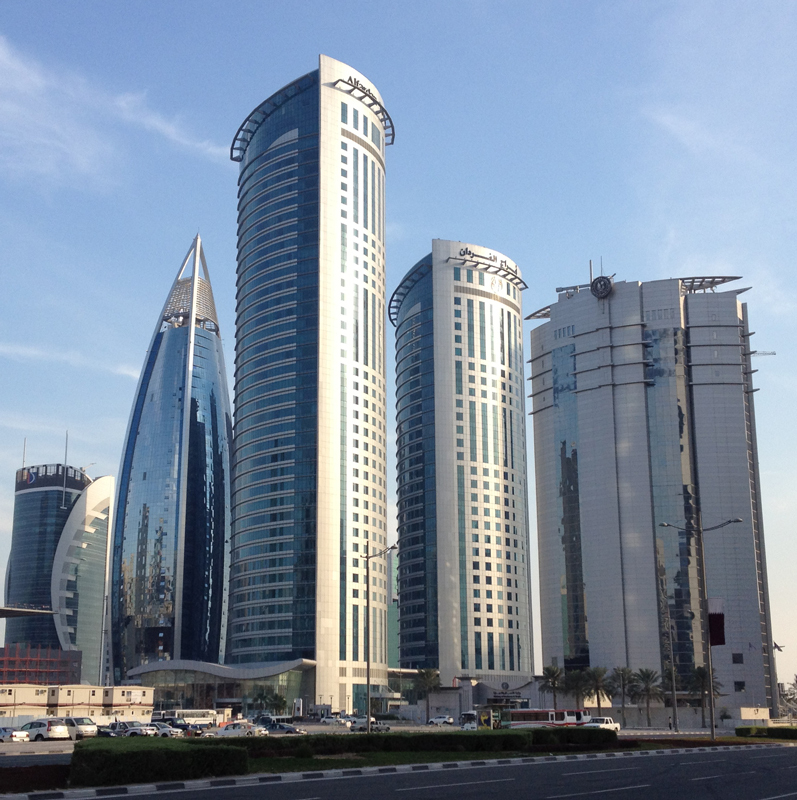 Here is the Al Fardan Towers and friends. And here is the iconic Tornado Tower. Ignore the building behind that it trying to make it look fat; it's jealous. Aside from that, some lazing around and more coding for OwlCon. This evening was set aside for romance. 'nuff said. [Day 57] December 25th, Christmas in Doha! I was pretty wiped out from Christmas Eve, so when the cocktails, wine, champagne, more wine, more champagne, etc. started flowing, I had to cry "uncle" eventually. I think UK folks have a genetic tolerance for alcohol; either that or they are the result of some mad experiment to increase alcohol tolerance. With the lack of sleep and the alcohol teaming up on me, I even had some caffeine (cue dramatic music) in the form a cup of tea, because I would very likely have dozed off in mid-bite during dinner. I headed back home and soon went to bed for much needed rest. I am starting to lose track of time...which I am told is a good thing on vacation. Definitely not stressing out about things. I even spent some time playing computer games, which is a stark indicator that I have lots of time on my hands. I said good bye to my lady friend, whose short term assignment here is ending. "We'll always have Doha" still sounds cheesy to me...but it's true. [Day 59] December 27th, Tuesday, Wave Pool and The Tex Mexening! It was a tad windy today, which allowed me to capture this cool footage. After a long day of completely goofing off, I recruited my friend Eric to go with me to try out Paloma, in the Intercontinental Hotel, which claims to be Tex Mex. Eric is the proud owner of a shiny new Qatar Driver's license and a rental car. Freedom! It was really weird driving around Doha and not expecting to get hit by a car at any moment. It gives me hope if I ever get a license and car here. What we saw when we arrived was not what we expected. It was basically a bar* that had a kitchen next to it / in it. I am not kidding. you walk in, you see bar tables, a bar, big screens with sports on them, more bar tables, people drinking and smoking, and then, BAM, a kitchen staring right at you, daring you to order food. The only encouraging sign I saw was some peppers hanging in the kitchen. Doha cultural norm interlude: This bar versus restaurant primacy aspect is important actually. You see, if it's a bar that serves food, then you need to have your passport or a Qatar resident permit to show them at the door to get in. However, if it is a restaurant that serves alcohol, they don't care. Don't ask me how that makes sense, but it is what it is. We sit down and peruse the menu, which is not a typical Tex Mex menu. It was more like an intercontinental menu with a lot of Mexican-influenced dishes. There was one taco dish, one burrito dish, one enchilada dish, and a lot of other dishes that could have been in any restaurant. Still, we were determined to try Doha Tex Mex, so we got Nachos for an appetizer, he ordered the burrito meal and I ordered the enchilada meal. The nachos were very nacho-ish. Tortilla chips, good start. Cheese, meat, jalapenos, etc. They were good, not great and what stopped them from being great was the lack of Tex Mex flavoring. It tasted very Tex Mex adjacent. Close, but not quite. Don't get me wrong, they were quality ingredients, but the recipe for nachos is not chips, meat, cheese. You actually have to put some seasoning in there to get the Tex Mex part going. Still, they were good. OK, so the main courses arrive and, again, good, quality ingredients, but the resulting flavor is Tex Mex adjacent. However, I will say the refried beans were pretty spot on. The rice was pretty close too. Verdict? It's not bad, but if you don't like eating around cigarette smoke or you are looking for authentic Tex Mex, you probably should look elsewhere. You see, the punchline is that this is a hotel restaurant and the Tex Mex adjacent meal I just described cost me about $60, and it just was not worth it. And with that...it looks like I am actually all caught up on my Doha Diaries! Hooray for vacation!